A close look at the PostgreSQL database, including programming interfaces and using it for WWW applications. The Qddb Database Suite by Eric H. Herrin, II and Gilbert J. Benson, Jr.
An introduction the freely available database suite called Qddb. Mr. Klein introduces us to a database called Beagle SQL that he developed as a learning experience. Web server analysis logs and mailing list management is made easy by using the /rdb database system—here's how to do it. This is the first of a series of articles about how to devlop networked applications using the various interfaces available on Linux. 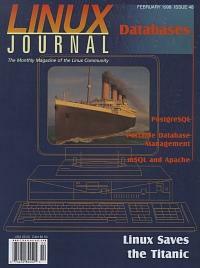 First article in a two part series on using Linux for visual effects in “Titanic”. This article will focus on the technical aspects of the project. Our series winds up with a detailed description of the toolbox, plug-ins and keyboard acceleration. A view of life with a hacker brought to us by a mischievous spouse who should know—Ms. Gwynne is married to Alan Cox. Review of personal Empress RDBMS for Linux. Learn all about Apache modules and mSQL programming using a web counting program as an example. A high school student tells us about using Linux as a server at school, at home and at work. Mr. Lerner shows us a way to use file elements to allow web site visitors to upload information or program files to the site. Setting Up E-mail This article will give you a properly working e-mail setup and an overview of various pieces of e-mail software. ispell: Spelling Checker Don't know how to spell? This is the command for you. United Railway Signal Group, Inc. The story of how Progressive Computer Concepts has turned United Railway into a Linux shop.